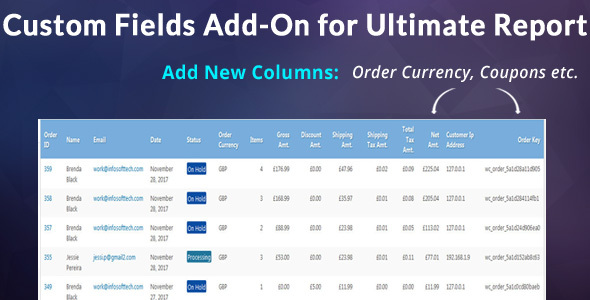 Custom Fields Add-on helps you to add custom fields on WooCommerce Ultimate Report’s Order Detail Report. Admin can add fields like Order currency, customer notes, billing/shipping details etc. this information is centralized at one place for admin’s ease of use for getting orders custom fields on the order detail page. Admin can add or remove new custom fields using Settings page, you can also define custom fieldsnames to be displayed on details page. This plug-in will work with most of the 3rd party plug-ins whose custom fields details are stored in POSTMETA table.